This statue is in Brand New condition... Only opened to inspect and photograph (box has minor shelf-ware but overall great condition). Don't miss out on adding this rare collectible to your FINAL FANTASY collection! This is serial # 1542. If you have any other questions. 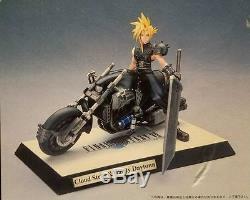 The item "Kotobukiya Final Fantasy VII 1/8 Cloud Strife & Hardy Daytona Statue Collectible" is in sale since Wednesday, March 08, 2017. This item is in the category "Collectibles\Animation Art & Characters\Japanese, Anime\Final Fantasy\Other Final Fantasy". The seller is "desroches78" and is located in Huntington Beach, California. This item can be shipped to United States, to Canada, to United Kingdom, DK, RO, SK, BG, CZ, FI, HU, LV, LT, MT, EE, to Australia, GR, PT, CY, SI, to Japan, to China, SE, KR, ID, to Taiwan, ZA, TH, to Belgium, to France, to Hong Kong, to Ireland, to Netherlands, PL, to Spain, to Italy, to Germany, to Austria, RU, IL, to Mexico, to New Zealand, SG, to Switzerland, NO, SA, UA, AE, QA, KW, BH, HR, MY, BR, CL, CO, CR, DO, PA, TT, GT, SV, HN, JM.